Original. 66% less sodium than regular table, sea and rock salts. All the same great taste. A great source of potassium. Suitable for nut allergy sufferers. Suitable for vegetarians and vegans. Kosher.Creating great tasting, healthier food Too much salt (sodium chloride) in the diet can increase the risk of high blood pressure, a major risk factor for heart disease and stroke. Switching to LoSalt, the UK's number 1 reduced sodium salt, will help you to maintain normal blood pressure. 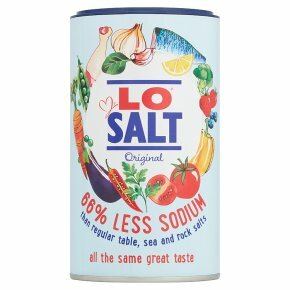 The perfect blend of two natural minerals salts, LoSalt is the healthier alternative for seasoning, cooking and baking, without compromising on flavour. LoSalt - the natural choice for your table and kitchen cupboard. Suggested Use Use LoSalt in the same way as you would use regular salt. People receiving medication for diabetes, heart or kidney disorders should consult their doctor using a sodium salt.